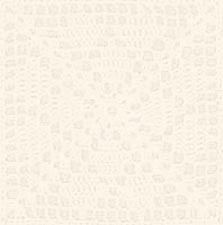 Plastic Canvas Corner was published by House of White Birches. Pattern pages without photos were printed on non-glossy paper, so these pages might show some age- yellowing. 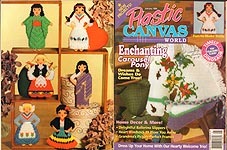 Plastic Canvas World, 1991. Projects include: Toy Car Garage, Pendant and Earrings, Dog Treat Container, Miss Mouse Cat Treat, Boudoir Beauties Boutique and Large Tissue Box Holders, "Quilted" Hangings, Halloween Wreath, Canisters, Coasters and Napkin Holder, Magazine Holders, Apple of My Eye. Tag scar on cover, but otherwise very good used condition. 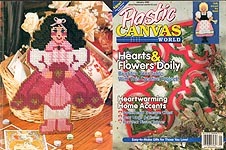 Plastic Canvas World, January 1992. Projects include: Toddler's Toys (Letters and Numbers Tray Puzzles, ZigZag Blocks), Sports Cards Storage Boxes, Towel Dolls (High Society, Country, Victorian), Chalet Shadow Box, Mini Totes (Toy Soldier, Doll), Santa Doorstop, Dancing Angel Garland, "Holiday Time" Bookend Covers, Photo and Keepsake Box. Very good condition. 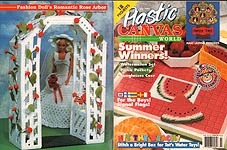 Plastic Canvas World, July 1992. 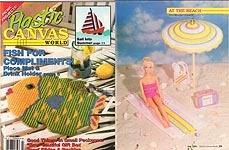 Projects include: Tropical Fish Place Mat and Drink Holder, Sailboat Hanging, Beverage Holders, Watermelon Tote, "He Loves Me" Wreath, "Bow"eautiful Gift Box, Fashon Doll At the Beach (Beach Unbrella, Portable Radio. Beach Mat, Tote Bag), Small Surprises Scarf Slides or Buckles (Teddy Bear, House, Stawberry, Wreath, Flower), Let's Have A Picnic (Plate or Snack Holder, Utensil Cup, Napkin Holder). Very good condition. 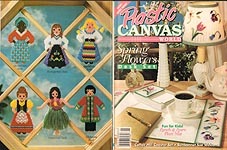 Plastic Canvas World, November 1992. 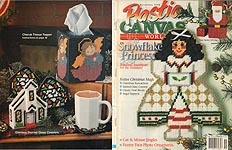 Projects include: Christmas Goose Tissue Box and Picture, House Shelf/ Key Holder, Frosted Ornaments (Oval Ball, Lantern, Bell), Candy Dish, Kitchen Cousins, Victorian House Bank, Easy- To- Stitch Ornaments (Diamond, Circle, Heart), Holiday Napkin Rings, Fleur- De- Lis Ensemble (Purse, Earrings and Pin), The Herald Angel). Very good condition. 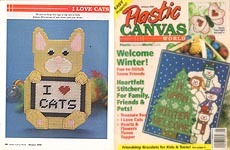 Plastic Canvas World, January 1993. Projects include: Train Tissue Box Cover, Kite and Heart Switch Plate Covers, Birdhouse Basket, memories Photo Mat, Outlet Cover- Ups (Heart, Tulips, Duck, Cup, Scottie), Stationery Folders, Rise 'n Shine picture, Boot/ Shoe Mat, Wall Fan. Very good condition. 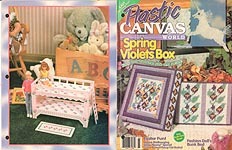 Plastic Canvas World, March 1993. Projects include: Bloom Where You're Planted Picture, Scalloped Basket, Bedroom Ensemble for Fashion Doll (Bed, Pillow, Throw Rug), Bashful Bunny, Bible Cover, Tulip Tote & Needle Case, Gingham Bunnies Set (Rectangular Box, Square Tissue Cover Box), Tiebacks and Shade Pull, Medallion Jewelry Bracelet & Pin, Powder Room Sign, Peek- A- Boo Place Mat. Writing on cover and numbers on one pattern to keep track of rows, otherwise, good used condition. 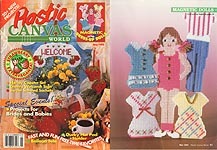 Plastic Canvas World, May 1993. Projects include: Balloon Tote, Kid's Card Holder, Beautiful Bold Barrettes (I Love America, Houndstooth, Buckled Belt), Sentimental Bridal Favors (Heart Boxes), Silvery Dreams Tissue Box, Hearts & Flowers Place Mats, Magnetic Dolls (Doll, Dress with Bow, Dress With Buttons, Dress With Necklace, Jeans or Shorts With Top), Strawberry Welcome Sign, Berry Basket Coasters, Birth Date Baby Carriage Sign, Ducky Hot Pad Holder. Very good used condition. 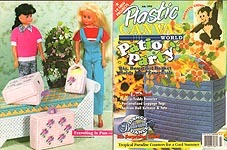 Plastic Canvas World, July 1993. Projects include: "Teach Me" Clown with alphabet, Anchors Aweigh Tissue Box, Mini Notepad Holder, Floral Hat Hanging, Pinwheels, Round "Pleasure" Boxes, Mini Puzzles (Cow, Clown), Buttrfly Buckle or Scarf Slide, We Love Red White & Blue Magnet, Happy Home Basket, Watermelon Jewelry Box plus Earrings & Pin Set. Very good condition. 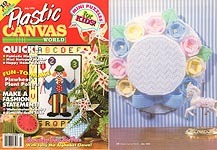 Plastic Canvas World, September 1993. Projects include: Spooky Pals (Ghost with Bat, Black Cat, and Jack O' Lantern), On the Prowl Rosebud Cat, Cowboy Boots Bookends, Western Style Bookmark, Glow- In- The- Dark Switchplates (Doll, Football), All Occasion Basket, Spot of Cheer Circle and Heart Mini Wall Baskets, Novel Note Keeper, Mouse Caddy, Elsie th Cow, Baby's Musical Mobile. Very good condition. 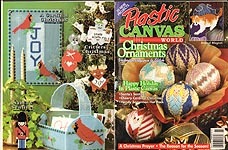 Plastic Canvas World, November 1993. Projects include: Berry Pretty Advent Tree, Three Sided Ornament, Gingerbread House, Special- Occasion Sparkle Braceket and Earrings, Gingerbread Family Garland, Angel Gabriel, Chubbies Angels Coaster Set, Christmas Photo Ornaments (Angel, Toy Soldier, Snowman, Reindeer). Rocking Horse Tote, Trim Your Tree (Noel, Wreath, Ice Skates, Tree, Sign, Candy Cane, Bell), Toy Soldiers (three sizes to hold treats), Light Bulb Treasure Box. Very good condition. 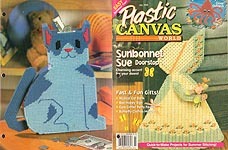 Plastic Canvas World, July 1994. Projects include: Six Sided Puzzle Block (continued from previous issues -- final two sides plus holding tray), Personal Picnic Pockets (Tulip Time, Basket Weave, Old Glory), Watermelon Placemat and Basket of Coasters, Pearls & Lace Boudior Set (Tissue Box Cover, Round Box, Picture Frame), Quick- Stitch Beach or Tub Box, Fashion Doll's Romantic Rose Arbor, Uncle Sam Fridgie or Pin, Sunny Day Sunglasses Case, International Signal Flag picture, Family Tree. Very good condition. 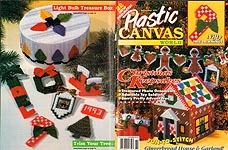 Plastic Canvas World, January 1995. Projects include: I Love You Mobile, OUr Home is Filled With Love Wall Hanging, Studious Bear Bookends, Bookmarks (Heart, Movie Ticket, Tulip), Animal Magnetism Kevin the Koala, Quilt Block Tote & Eyeglass Case, Sewing Basket, It's In the Mail Stationery Holder, Barrettte & Earring Set, Glow- In- The- Dark Switchplate Covers (Cat, Bear), Wipe Your Paws Welcome Sign, Discover Wildlife - Have Kids picture, Triple Heart wall decoration, Toolbox Just Like Dad's (Toolbox, Drill, Hammer, Wrench, Screwdriver, Ruler, Punch, Small Wrench, Square). Very good condition. Plastic Canvas World, July 1995. Projects include: By the Sea Magnets (Sammy Sea Horse, Danny Dolphin, Ollie Octopus, Suzy Starfish), Tropical Paradise Flamingo Coaster & Holder plus Napkin Rings, Personalized Luggage Tags (Heart, Rectangle), Animal Magnetism Chester the Chimpanzee, Tote- A- Teddy Traveler (Tote turns into playhouse bedroom & patio with teddie, swimming pool, swing, bench, bed, and toybox), Dance ballerina Dance dolls in colorful tutus made from silk flowers, Let's Have a Patio Party Basket, Cat Memo Board, The Red White & Blue Placemat & Napkin Holder, Fashion Doll Wicker Window Bench, Fashion Doll Suitcase & Tote. Very good used condition. 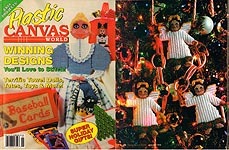 Plastic Canvas World, January 1996. Projects include: Hearty Welcome (Wall Pot or Letter Holder, Stamp or Trinket Box, Picture or Mirror Frame), Animal Magnetism Mickey Macaw, Dolls Around the World (Spanish, Danish, Japanese, Native American, Dutch, Indian), Ballet SLippers, Grandma's Sweethearts photo holder, Stick On Note- Pad Protectors, (in three sizes, with monograms), Heart Throb wall accent, Heart Wind Sock, Tell Time with a Dinosaur (teach kids numbers, shapes, and time), Giddy Up Horsey Carousel Broomstick Horse. Small note on front, but otherwise very good used condition. 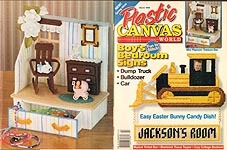 Plastic Canvas World, March 1996. Projects include: Tooterville Hometown USA (Country Church, Joe's Pizza Shop, Train Station & Platform, Post Office), Animal Magnetism Reggie Rabbit, Easter Wreath (Bunnies, Eggs, Cross), Fresh As Spring Checkbook Cover & Eyeglass Case & Notepad Holder, Sunflower Binder, Dainty Bunny Basket, Bunny in a Basket Tissue Box Cover, Lucky Irish Leprechaun, Lily Pad Coaster Set, Book Lover's Delight Bookmarks (Romance, Sci Fi, Mystery) Bunny Door Hanger. Two pages have been detached from binding -- all pages here, just two loose. Plastic Canvas World, July 1996. Projects include: Let's Celebrate! Bear door sign, Musical Birthday Favor Penguin, Animal Magnetism Katie Kangaroo, Blossoming Door Crown, Summer Delights Vacation Tote, Watermelon Fan, Funny Face Fan, Crafter's Caddy, Tropical Fish Coasters, Deep Sea Party Mermaids & Dolphins, Sunny Weather - Flower Picture Frame and Magnetic Picture Frame and Note Clip, Writing, small stains (look like coffee) on one page. Plastic Canvas World, September 1996. 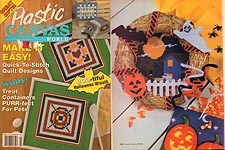 Projects include: It's A Ghostly Surprise Pumpkin Basket, Bat Wind Sock, Animal Magnetism Owl, Down on the Farm Magnets (Cow, Horse), Welcome Spooks Door Sign, Mini Western Boots, Barnyard Clock, Betsy Ballerina & Johnny Soccer Bookends for Boys & Girls, Anytime is Apple Time (Place Mat, Coaster Set, Napkin Holder, Trivet), The Gracious Ghost Treat Basket and Mini Basket. Very good condition. Plastic Canvas World, November 1996. 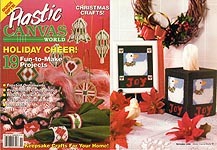 Projects include: A Cardinal Christmas (Gasket, Door or Wall Sign), Animal Magnetism #12: Kitty Cat, Holiday Earrings Stars, Elegant Christmas Balls (Peppermint Santa, On Angel's Wings, Bargello, VIctoriana, Hearts- A- Glow), Critters' Christmas (A Mouse's Letter for Santa, A Joyful Reindeer), The Reason For the Season Doorknob Hanger, Christmas Tree Farm Door Crown, Welcome Winter Place Mat, A Christmas Prayer (Dove and Peace), Christmas Card Holder, Playful Pets Ornaments (Kitten in Box, Puppy in Stocking), Santa's Sentinel Ornament, Snowman Hat Rack. Good condition --slight overall wear, some page corners bent. 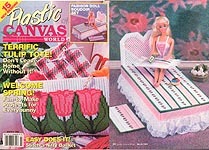 Plastic Canvas World, January 1997. Projects include: Lunch & Learn Place Mat, Rings Around a Circle Mobile, Animal Magnetism Petunia Piglet, Sunbonnet Sue Welcome, Arrow Elegance Tissue Box Cover with matching Frame and Basket, Teddy Bear Heart Frame, Spring Flowers Desk Set (Lamp Shade, Note Pad Holder, Desk Top Pad), Coffee Mill Coaster Set, Jeweled Medallion, Dolls Around the World Chapter 2 (Chinese, Jamaican, Swedish, Hawaiian, Italian, Hungarian). Notes and wear on one graph. 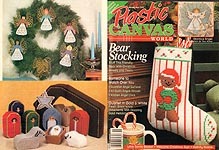 Plastic Canvas World, November 1997. Projects include: Guardian Angels Garland, Welcome Christmas wall hanging, Flowered Earring Holder, Animal Magnetism #18: Charlotte Chipmunk, Nativity Scene, Kitchen Angel Clock, All God's Angels Wreath, Stunning Stockings ( Angel, Bear), Snowman Candy Dish, Little Santa Basket, Glorious Angel, Quartet in Gold & White (Snowflakes). Very good condition. 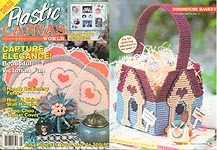 Plastic Canvas World, March 1998. Projects include: Mini Playroom Treasure Box, Smell the Roses sign, Animal Magnetism Robbie Robin, Bedroom Door Signs (Dump Truck, Bulldozer, Custom Car), Little Bunny Basket, Playful Bunny Wall Hanging, Easter Bunny Candy Dish, Colorful Bird and Flower Plant Pokes, Cozy Cottage Bookends, Shamrock Tissue Topper and Musical Trinket Box, Scent- sational Birdhouses. Very good used condition. 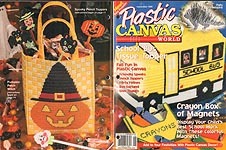 Plastic Canvas World, November 1998. Projects include: Christmas Cuncatchers (Santa, Gingerbread Man, Snwoman), Animal Magnetism #24: Percy Polar Bear, Cat & Mouse Jingles, Santa Gift Bag, Holiday Sweetheart Snowflake Princess candy cane holder, Angel Triptych, Glorious Stained Glass Coasters (with Church holder), Kitty's Christmas Stocking, Cherry Christmas Blocks, Seasonal Samplers #4: Winter, Christmas Cherub Tissue Topper. Very good used condition. 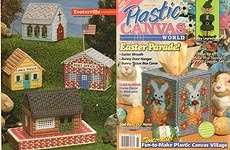 Plastic Canvas World, March 1999. Projects include: Fashion Doll's Bunk Bed & Rug, Animal Magnetism #26: Ulysses Unicorn, Spring Violets Box, Bless This House, Rejoice! Holiday Sweetheart: A Comely Colleen, Bedside Tooth- Fairy Boxes, Easte Bunny's Wheelbarrow, Some "Bunny" Special frame, Easter Bonnet Pussycat Basket, A Touch of Spring For Bed & Bath Watebasket and Tissue Topper. 3- hole punched, but otherwise very good used condition. 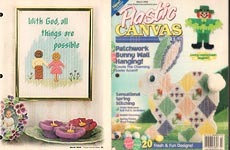 Plastic Canvas World, May 1999. Projects include: Countryside Mirror, Animal Magnetism #27 Golden Retriever, Kiddy Reminder & Key Holder, Violin Wall Hanging, Doggy Duo Frame & Leash Holder, Baby's Tissue Topper, Baby Bootie Bank, Ring Bearer Pillow & Flower Basket, Fiesta Place Mat & Napkin Ring, Easy Place Cards & Napkin Rings, Kids Can Stitch Photo Frame, Age is A Matter of Mind sign. 3- hole punched, but otherwise very good used condition. 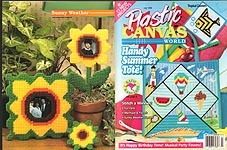 Plastic Canvas World, July 1999. Projects include: Bee Happy Sign, ANimal Magnetism $28 Omar Octopus, Sunbonnet Sue Doorstop, Blooming Light Switch Covers (Watering Can, Picket Fence, Flowerpot), Homey Door-Topper, Beach Bag, Musical Cat Bank, Butterfly Clothes Hanger Cover, Belt it, Cute Critters party Favors (Tiger, Elephant, Pig). 3- hole punched, but otherwise very good used condition. 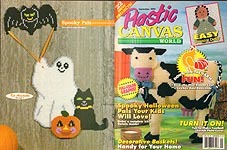 Plastic Canvas World, September 1999. Projects include: Pilgrim Angels Napkin Holder & Rings, Animal Magnetism #29 Patty Porcupine, Spooky Pencil Toppers (Ghost, Cat, Bat, Witch, Jack O Lantern), Scarecrow Coaster Set, Pumpkin Patch Witch, Boo Garland, Welcome Spooks, Flirty Felines Coupon Keeper & Eyeglass Case, Crayon Box Magnets, School Bus Tissue Topper. 3- hole punched, but otherwise very good used condition. 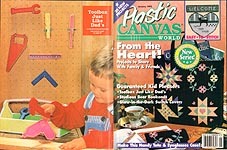 Plastic Canvas World, January 2000. Projects include: Purr-fect Tissue Topper, Bear Hugs & Kisses Frame, Animal Magnetixm #31 Danny Dolphin, Dolls Aorund the World Chapter 5 (Nigerian Doll, English Rider, American Bride, Irish Dancer, Czech Doll, Ms. Quebec Doll), Spring Song, Backpack Zipper Pulls (Angel, Football), God Loves You, Barrette Blossoms, Windowsill Nests, Hearts & FLowers Doily, Sweetheart Treasure Chest, Snowman Wind Sock, Valentine Sweetheart. Writing on one page in marker that unfortunately bled through to reverse (Barrette Blossoms) -- still readable, but a little difficult. 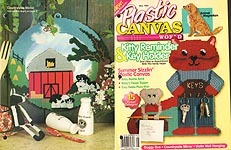 Plastic Canvas World, March 2000. Projects include: Violets Say Welcome, Anima Magnetism #32 Donna Duckling, Missy Mouse Ensemble Eyeglass Case and Tissue Topper, Quick- As- A- Wink Earrings (Royalty, Springtime, Patriot), It's Teatime Trivet, Patchwork Bunny, Spring Posies Plant Pokes, Lucky Leprechaun, Rabbit Doorstop, Bead- Trimmed Basket, Angel's Blessing, Dogwood Cross, It's Easter Egg Time Basket, All Things Are Possible picture. 3- hole punched, wavy as if it has been damp. I'm not detecting any musty odor, though. 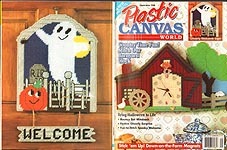 Plastic Canvas World, January 2002. Projects include: Let's Be Friends Bracelets, Animal Magnetism #43 Cory Cardinal, Hearts & Flowers Tissue Topper, Dolls Around the World Chapter 7 (Sicilian, Lebanese, Russian, Icelandic, Panamanian, Canadian Mountie), Hearts Take Flight Butterfly, Winter Welcome, Tiny Trasure Box, Music Music Music CD Box, Teady Bear Candy Dish, I Love Cats. Very good used condition.